Story by Carolyn White | Cedaredge, Colo.
Leah spinning at Farm and Ranch Days in Fruita. A new addition to the herd. Raw fiber on the sorting table. Dan always has alot of help unloading the hay. Up until 2004, Dan and Leah Reynolds of Loma, Colo., had always kept goats to eat the weeds down on their 6.5 acres, but needed something more profitable. Because she has a strong interest in natural fibers, Leah started researching Huacaya Alpacas — a breed known for having a crimp in the fleece, giving it a teddy-bear look — as well as taking classes and learning how to sort and spin. "Alpaca fiber is amazing," she says. "It has a really soft texture because unlike wool, which 'hooks' a little, these hairs have smooth scales. It is fire-resistant, moisture absorbent and non-allergenic (due to the absence of lanolin) and once you've experienced the products you'll want more." What started as a hobby has developed into on-line yarn, sofa throw and blanket business under website name http://www.HorseMountainAlpacas.com. In addition, with partner Kathy Joseph they've started "Home Grown Rugs" by shipping leftovers from the leg, belly and neck areas of their livestock to a hand-weaver in Texas who makes beautiful, sturdy floor coverings. "We always felt that this had to be about the fiber. Our focus has remained on the high-quality end products, and getting them into the hands of the public." Members of the camel family, Alpacas weigh between 100 and 200 pounds and stand approximately 36-inches tall at the withers. Mild-tempered, gregarious and curious, they are gentle enough for children to handle and can easily be taught to lead. As a bonus, when compared with other livestock they eat very little: one bale will feed 8 to 10. "They only require 11 to 14 percent protein, so alfalfa is way too hot for them," Leah continues, adding, "we also provide free-choice minerals to ours along with pellets for nursing and pregnant mothers." But beware, because these innocent-looking, mop-topped creatures have three stomachs and chew cud just like cows "they have great spit available … and yes, they will use it, but usually only during medical procedures or at shearing time." When they brought their first three animals home (the herd now numbers 39) Dan and Leah "Didn't know any other breeders in the area, but we soon sought out and made many lifelong friends of fellow Alpaca lovers. 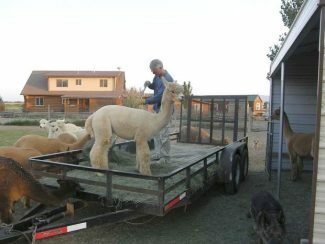 With their help we formed the Alpaca Breeders of Western Colorado, which is a support and educational group." Leah has been President of ABWC for the last three years, helping to plan Western Colorado Alpaca Days (held each October in Grand Junction) and bringing educational opportunities to the area. As if that weren't enough, Leah and Dan are also involved in a state group, ABR (Alpaca Breeders of the Rockies); a national group, AOBA (Alpaca Owners and Breeders of America); and a couple of fiber co-ops across the United States. Most recently, they've become founding members of the Alpaca United group which provides an outlet for breeders to sell their fiber directly to buyers. "This is something very new to our industry. We are excited that the focus is shifting to be about the fiber!" 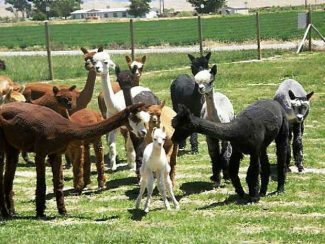 Individually, Alpacas produce between 6 and 12 pounds of soft, luxurious fleece per year, and "we got a total of 325 pounds after shearing this season." It is so thick and dense that it often comes off in one solid piece that "we then lay on a table with a screen to shake out." Trained to grade and sort the raw fiber (a service which she also provides to other farms) Leah says, "This is essential in sending the best raw product we can to processors. We do it according to color, fineness and length and then ship the fiber to be made into many different things. 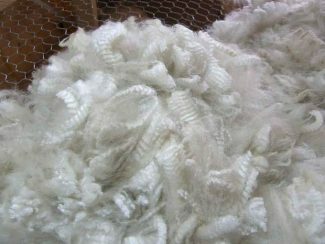 Alpaca is wonderful to blend with and enhance the qualities of other natural and man-made fibers. For example, socks are the best when you mix a mid-grade with something a little sturdier and more washable. Sorting and grading allows me to touch and experience hundreds of pounds of fiber each year, which is critical in helping producers to match theirs with the best application." Thanks to the careful decisions that Leah and Dan make when breeding Alpacas — choosing ones with the best chance of having offspring to enhance positive qualities — the Reynolds' latest product won the "Yarn of the Week" award from the mill that processed it. 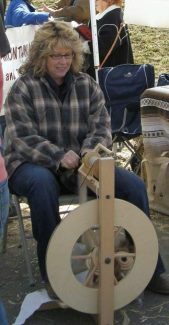 Using her own antique spinning wheel at home, Leah has become adept at spinning: she also works with weave, wet felt, needle felt and does crochet, which has "allowed me to see how Alpaca works in many different applications." She enjoys making felted hats, beanies, booties, scarves, fingerless mittens and many other products which are then sold at Farmer's Markets, festivals and craft shows as well as on their Etsy site http://www.Etsy.com/Shop/HorseMountainAlpacas online.